Bloomfield High School in Bloomfield, NJ, will play host for an additional week of NJ Premier Volleyball Camps, August 1 through August 5, 2016. Due to the increased demand from players from North Jersey, NJ Premier Volleyball has decided to expand and will be adding an additional location for their Girls volleyball camps. Bloomfield High School, offers campers in Bergen, Essex, Hudson, Morris, Passaic and Union Counties the opportunity to attend a top notch summer volleyball camp featuring some of the most accomplished coaches in New Jersey, New York and Pennsylvania. The camp is available to campers entering grades 6 to campers entering their first year in college. NJ Premier Camp Director and St. Joseph HS Boys Coach, Miguel Cabrita is excited about this new opportunity. "NJ Premier camps have always drawn athletes from Mercer, Middlesex, Monmouth, Ocean and Somerset counties, as well as from some other counties and states but the commute for some of these athletes was difficult. Now female volleyball players from Northern New Jersey, and the surrounding areas, will be able to attend a NJ Premier Volleyball camp close to their homes," says Miguel Cabrita. "We expect this new location to sell out like our other weeks do down in Metuchen and Lincroft. North Jersey is known for its high level girls volleyball programs so we expect a strong turnout." NJ Premier Volleyball has become the largest and most successful volleyball camp in NJ. NJ Premier Volleyball offers 4 full weeks of volleyball camps; one week for boys and three weeks for girls. The success of the NJ Premier Volleyball camps can be attributed to the experience level of its coaches and the low player-to-coach ratio. With top notch collegiate, club, and high school coaches from NJ and beyond, the accolades of NJ Premier's coaches clearly set this camp apart from others. "We pride our camp on the ability to bring in successful coaches who are able to infuse their experience and techniques with our beginners, our intermediate players and our more advanced athletes," states Cabrita. Christian Brothers Academy in Lincroft, will play host for an additional week of NJ Premier Volleyball Camps, August 3 through August 7, 2015. Due to the increasing demand, NJ Premier Volleyball has decided to expand and will be adding an additional week of Girls volleyball camp. Christian Brothers Academy in Lincroft, offers campers in Monmouth and Ocean Counties the opportunity to attend a top notch summer volleyball camp featuring some of the most accomplished coaches in NJ, NY and PA. The camp is available to campers entering grades 6 to campers entering their first year in college. NJ Premier Camp Director and St. Joseph HS Boys Coach, Miguel Cabrita is excited about this new opportunity. "NJ Premier camps have always drawn athletes from Middlesex, Essex, and Monmouth counties, as well as from some other counties and states but the commute for some of these athletes was difficult. Now female volleyball players from Monmouth and Ocean counties, and the surrounding areas, will be able to attend a NJ Premier Volleyball camp close to their homes," says Miguel Cabrita. "We expect this new week to sell out like our other weeks do up in the Middlesex area because Monmouth and Ocean counties are a hot bed for girls volleyball programs." NJ Premier Volleyball Camp is still growing. There are additional new locations on the horizon for the summer of 2015 and beyond. Stay tuned for more information to follow. NJ Premier Volleyball Camp will be looking to expand for the 2015 Summer Season. After being sold out every summer since 2011, and with the increasing amount of requests from campers in different areas, NJ Premier Volleyball will be looking to expand for the summer of 2015. The Metuchen Sportsplex along with the gymnasium at St. Joseph High School will continue to be NJ Premier's home base. However, other venues south and perhaps even north of Metuchen, NJ may soon be home to the newest branch of NJ Premier Volleyball. More information will be available in the Fall of 2014. With the previous three summers selling out, NJ Premier Volleyball expanded their camp weeks to include up to 5 courts in order to better accommodate the increasing demand. Within a matter of weeks of announcing the expansion, NJ Premier Volleyball was once again sold out. "With so many returning campers and great referrals bringing in new campers, we reached full capacity in no time at all," said Camp Director Miguel Cabrita. NJ Premier Volleyball Camp has become the leading volleyball camp in all of NJ. "We have been receiving requests from players who live over an hour from Metuchen and we have even had some players come from out of state and stay with family for a week just so they can attend the camp," says Cabrita. NJ Premier Volleyball saw record numbers this summer. Between the boys camp week and the two girls camp weeks, NJ Premier Volleyball Camp hosted over 250 campers. With additional locations and courts being added for the Summer of 2015, NJ Premier Volleyball Camps will continue to grow and provide the best volleyball camp experience in NJ. 2013 NJ PREMIER CAMPS SELL OUT! 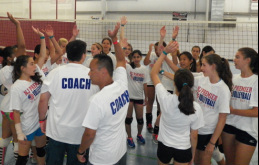 In both 2011 and 2012, the NJ Premier Volleyball Camps sold out. With such high demand, NJ Premier expanded their camp series by adding a second week for the girls in 2013. By May, the boys camp was sold out and both of the girls weeks only had a few spaces remaining. Eventually by June, the girls weeks were full and a waiting list was started. NJ Premier Volleyball Camp has become the "premier" camp in NJ for volleyball. Catering to athletes entering grades 6 - 12, NJ Premier Volleyball hosted 218 campers this summer, with most campers attending the full day and with many campers attending 2 weeks. NJ Premier is looking forward to yet another amazing summer camp series in 2014. Don't miss your opportunity to work with some of the best collegiate and high school coaches in the state. Register today to secure your spot!!! NJ PREMIER NEWS FEED....more news coming soon!